If your daily activities are compromised by damaged knees, often due to injury or various forms of arthritis, you may opt to undergo a total knee replacement. The American Academy of Orthopaedic Surgeons, or AAOS, explains that, during this surgery, the surgeon will remove damaged cartilage and bone from the knee and position new metal and plastic joint surfaces to restore its alignment and function. Sometimes, both knees are replaced concurrently. Although recovery time ranges anywhere from three to six weeks, full rehabilitation can be ongoing. Bike riding is one of the recommended activities to pursue after undergoing a total knee replacement. Presumably, your orthopedic surgeon will prescribe a specific duration of physical therapy following the surgery. If no regimen is prescribed, it is important to consult the physician before beginning rehabilitative activities, such as using a bicycle. 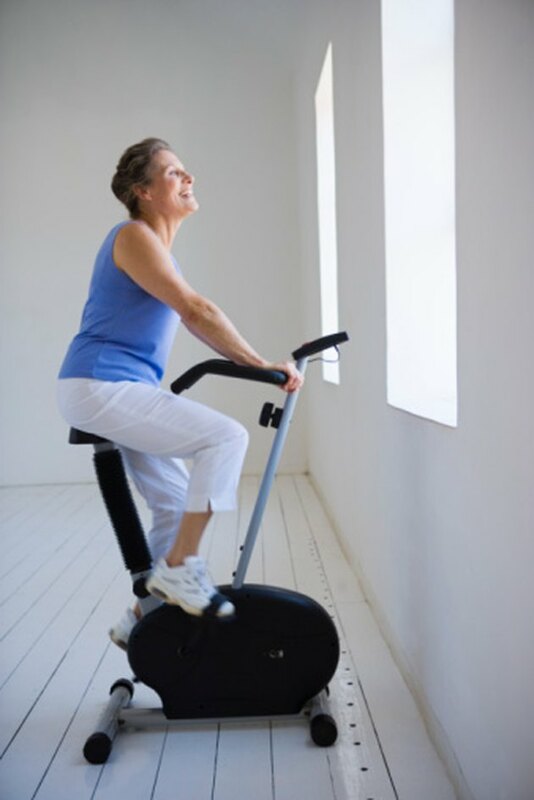 The AAOS believes that riding a stationary bicycle can help maintain muscle tone and flexibility. Because pedaling a bicycle requires you to do an equal amount of bending and extending of the knee, the joint is conditioned for maximum function. Avid exercisers may be accustomed to moderate to high-intensity workouts. However, for patients who have recently undergone a total knee replacement, it is important not to over-exert initially. On a stationary bicycle, you should be seated at a height in which your foot just touches the pedal and the leg is as straight as possible; over-bending the knee during a revolution may cause damage. In terms of intensity, the AAOS recommends that the resistance should initially be set to "light" and advanced to "heavy" as your strength and comfort level increase. When you have completed the allotted amount of physical therapy, you should discuss your plans to pursue outdoor cycling with your physician. Although biking outdoors may be comparable to using a stationary bike, there are additional factors, like the model of bicycle and a change of terrain, that you should consider. The doctor may recommend a certain type of bicycle or maximum gear to use. It may also be advised that you remain on smooth terrain, like asphalt, to prevent any undue stress on the knee during cycling. 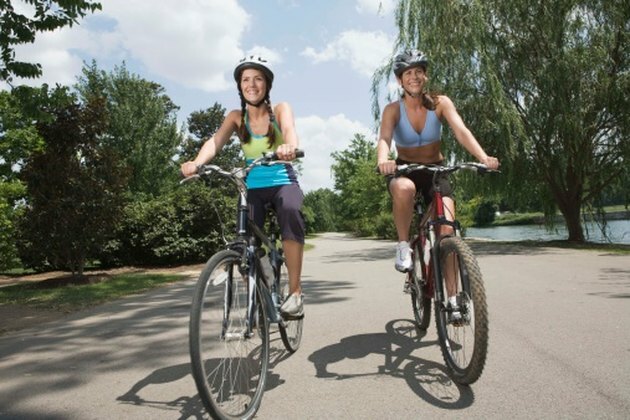 Bike riding after total knee replacement surgery offers more than just increased function and maintenance of the joint. Riding a bicycle is a form of cardiovascular exercise, which aids in weight control. Since excess body weight can put extra stress on the knees when standing or walking, maintaining a healthy weight through bike riding can be beneficial. For people with knee replacements, biking also provides a safe alternative to running and jogging, both of which are high-impact activities that could compromise the integrity of the new knee.